Now I hope you will forgive me a little bit of nostalgia here since I have been rummaging back through some old personal photographs, long since forgotten here, in a deep desk drawer. 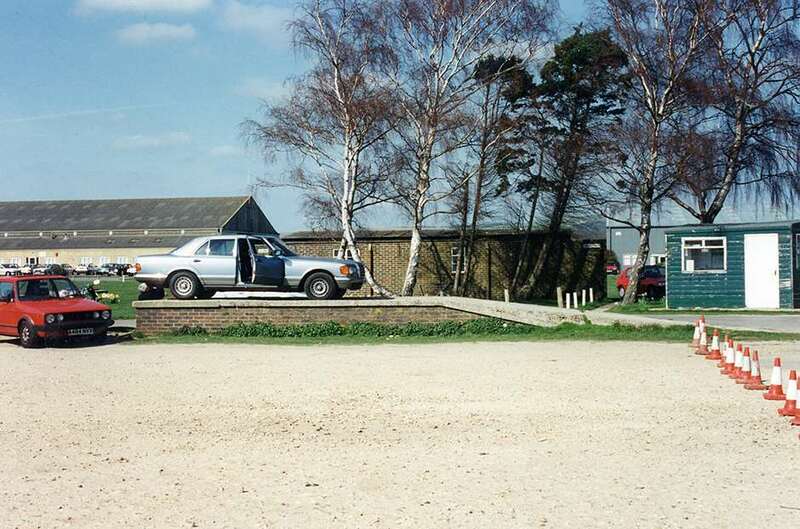 They record a Goodwood Motor Circuit which is now not so much long-gone as simply pre-makeover, during the 1990s. 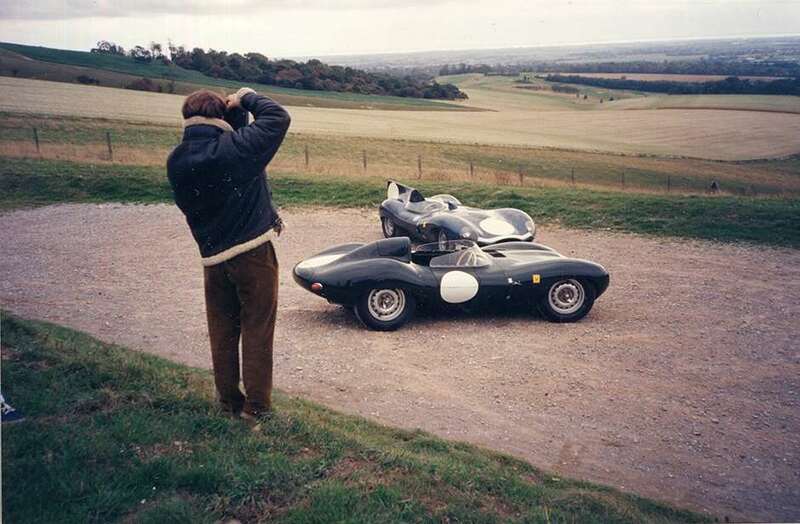 Well, we collected the cars from Lightwater and cruised them down in convoy through Hindhead, Midhurst, over the top of the Trundle Hill – where we paused for Mick to complete some photography, D-Types in the foreground, and the Motor Circuit on its coastal plain down below (see photo) – and then sailed on down past Goodwood golf club, the Kennels and the House, over what was then a simple cross-roads – without its modern roundabout island – before turning right into the Motor Circuit and down through the vehicle tunnel into the paddock area. You can see from the photos what we found of the paddock in those days –scattered gravel and crumbling concrete, patched with shaggy grass and weeds, longer grass where the majority of the old pit row and its towers had stood, and all paddock shelters long, long gone. Gazing across the track – happily preserved in far better shape than the old paddock area – in those days two buildings dominated the scene. 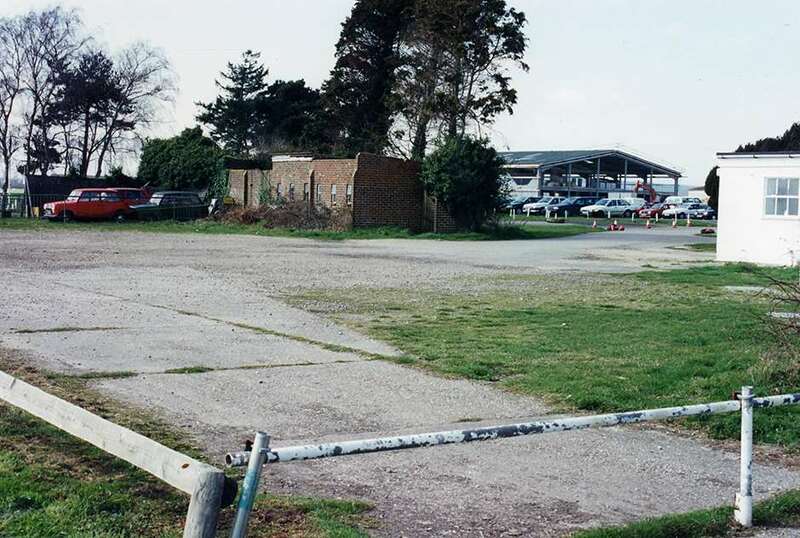 One was the chunky, square-cut control tower preserved since wartime and still with us today, while the other was the Motor Circuit’s long, low restaurant building – then a leaking, mouldering, creaking structure in the twilight of its relatively brief life and due for imminent demolition. Studying these old photos now is interesting because the sight of one or two features retained during the circuit’s restoration position the shots perfectly. Study the picture of hairy Hugo with the two Ds and there on the extreme left is the mouth of the surviving pedestrian tunnel, signposted then ‘Subway to Restaurant & Bar’. Just above it in this image, on the far side of the track, can be seen the lifting-barrier on the access road leading out to what is today the Motor Circuit’s main pedestrian entrance. 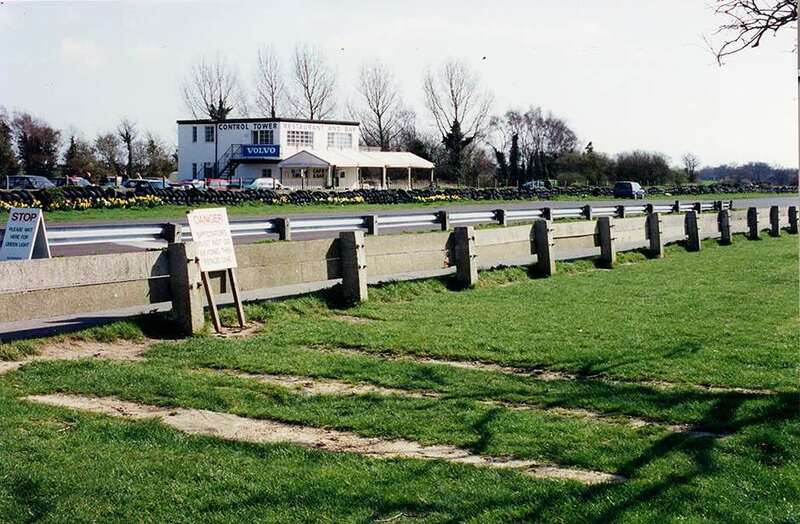 A hefty section of the famous old Goodwood double-beam ferro-concrete crash barrier lines the old pit lane. And there in the background, on the circuit outfield, stands the ill-starred restaurant building – not long for this world. 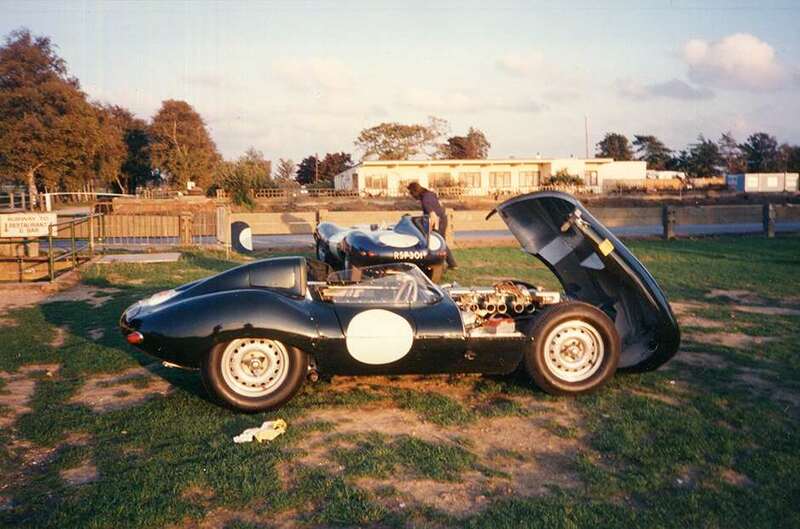 Some years later, in 1997, I took a series of reference photos of the Motor Circuit, just to record what was there when we began restoring the historic old wonder. Here’s (above) another shot of the paddock/pit-row/control tower scene – the tower itself having now inherited restaurant duties since the former building had long-since gone, and at the time still lacking the modern-day penthouse structure on its original flat roof. See the three concrete strips in the thickly grassed foreground? They were the surviving foundation of the old commentators’ tower, again indelibly indicating its former position. Back in the paddock itself there are two features pictured, one whose memory leaves me faintly embarrassed, while the other actually gives me a frisson of pride. The embarrassing one is the old permanent loading ramp which was erected on the tunnel end of the paddock back in the days when many entrants would transport their racing cars in ex-army flat-bed trucks and converted coaches, and it was quite a production to run out the loading ramps from each of them. Here at the Motor Circuit one could merely back up the team transport to the brick and concrete ramp, open the side-hinged doors and wheel the car out over a couple of easily-handled planks no more than a couple of feet long, just to bridge the gap. In contrast, the old brick-built toilet block which still stands today beside the assembly area is an entirely different matter. That to me is an historic structure in which some of our sport’s finest sought comfort before performing truly great deeds on circuit. Perhaps surprisingly, compared to the unloading ramp, there was quite a significant faction attending our meetings who wanted the block demolished, out of the paddock, out of their hair, but I always argued energetically for its preservation. And so there it stands today – not only preserved, but indeed enlarged. And if any ageing old enthusiast can ever feel proud of having been associated with the salvation of a toilet block, then believe me it’s yours truly. Sometimes one simply has to stand up for one’s beliefs… but the best memory for me is that I was even given the opportunity to do so.